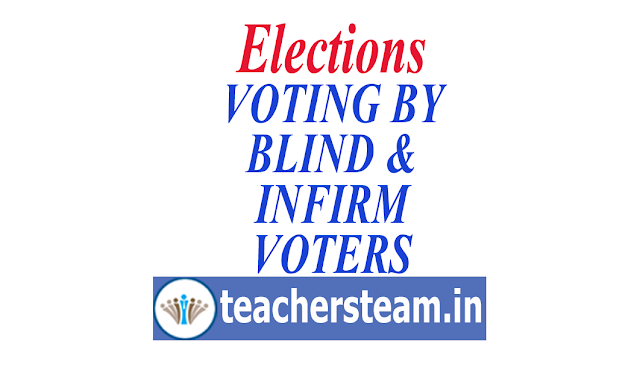 Infirm voters who are capable of voting themselves by pressing the button of the candidate of his choice on the Balloting Unit of EVM shall be permitted authorized companion only up to Voting Compartment in the polling station, not inside the Voting Compartment. This will apply in cases where the nature of physical infirmity is such that the elector needs assistance only for his movement and not for voting. The Presiding Officer has to take decision in such cases. No person shall be permitted to act as a companion of more than one elector at any polling station on the same day. As per the first proviso to sub-rule (1) of Rule 49N, one person cannot act as the companion of more than one elector. In order to facilitate the polling staff to ensure compliance of these provisions, application of indelible ink shall also be applied to the companion. Indelible ink shall be applied on the right index finger of the companion. Marking of ink on the left index finger of the elector in such cases shall continue to apply as per the existing provisions. Before an elector is permitted to take with him a companion inside the Voting Compartment, the right index finger of the companion should be checked to ensure that it is not already marked with indelible ink. If it is found to be already marked, such person cannot be permitted to be companion for the purpose of Rule 49N. Before any person is permitted to act as a companion of an elector, he shall be required to declare that he will keep the vote recorded by him on behalf of the elector a closely guarded secret and that he has not already acted as the companion of any other elector at any other polling station on that day. The declaration shall be obtained by you from the companion in the form prescribed by the Commission for the purposes vide Annexure 10. Sub-rule (2) of Rule 49N provides that the Presiding Officer shall keep a record of cases where electors record vote with the assistance of the companion in Form 14A. This should cover all cases where the companion is permitted to go into the Voting Compartment with the elector to assist him in recording the vote. Cases where a companion only comes to assist the elector in his movement and does not go into the Voting Compartment shall not be included in Form 14A. Presiding Officer shall keep a record of all such cases in Form 14A. This record of blind and infirm voters in Form 14A will be kept in a packet super scribed as “NON-STATUTORY COVERS” and deposited at the Collection Centre after close of the poll.